As introduced by Sen. Dan Hughes of Venango, LB758 would require state natural resources districts and interlocal entities that buy private land for the development of a streamflow augmentation project to work with the county in which the project is located to reduce the project’s impact on the local property tax base. A pending Natural Resources Committee amendment would replace the bill and instead would authorize NRDs and interlocal entities to make voluntary payments in lieu of taxes to the county. The amount of the payments would not exceed the property taxes that would have been paid if the land were subject to taxation. 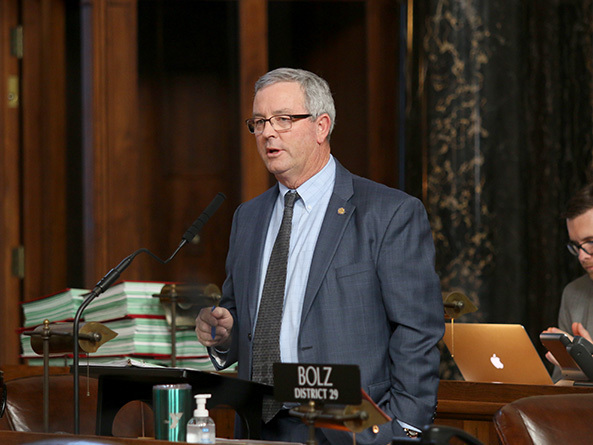 Hughes said the amendment would address the loss of property tax revenue to counties under the Rock Creek Augmentation Project and the Nebraska Cooperative Republican Platte Enhancement project. Both projects help the state meet streamflow requirements under the 2003 Republican River Compact, which allocates the use of surface water between Colorado, Kansas and Nebraska. “N-CORPE and Rock Creek were conceived and are being paid for locally to solve the state of Nebraska’s problem,” Hughes said. N-CORPE, an interlocal agency created in 2012 by four of the state’s NRDs, bought 19,500 acres in Lincoln County that it retired from irrigation so it could pump groundwater into the Republican and Platte rivers to help the state meet streamflow requirements under the compact. The Rock Creek Augmentation Project acquired approximately 5,200 acres in Dundy County for the same purpose, Hughes said. An occupation tax on irrigators within the four NRDs funds the project. Lincoln and Dundy counties both lost property tax revenue after those projects converted irrigated land to grassland, which has a much lower tax valuation. Hughes said N-CORPE and Rock Creek have paid property taxes assessed by the counties but that they have done so in protest because it was not clear if a public entity should pay property taxes on that land serves a public purpose. In July 2017, the state Tax Equalization and Review Commission ruled that N-CORPE was exempt from paying property taxes for that reason. Lincoln and Dundy counties appealed that ruling to the state’s higher courts, Hughes said. He said the amendment, by allowing N-CORPE to make payments voluntarily, avoids that prohibition while helping to offset lost property tax revenue to the counties. Hughes said the N-CORPE and Rock Creek projects are critical to ensuring the state’s compliance with the Republican River Compact and the Platte River Recovery Implementation Program. The amendment also would require joint entities or NRDs to provide public notice of their intention to proceed with a water augmentation project and to hold a public hearing. They also would be required to publish an annual report on a project’s finances and activities, including the amount of water pumped. Sen. Mike Groene of North Platte said N-CORPE took 7 percent of Lincoln County’s irrigated acres out of production and converted it to grassland. The county would have received approximately $730,000 in property tax revenue last year had the land still been irrigated, he said. It generated only $196,000 in property tax revenue as grassland. Groene said he supports the amendment because it would not require local governments and school districts to refund the taxes N-CORPE paid in protest for the past several years if the courts uphold TERC’s decision. However, he said, his LB1123 would be a better solution to the problem by allowing N-CORPE to sell the land to private owners while retaining the water for use in the augmentation project. This would return the land to the county’s property tax rolls and allow private owners to use it for dryland farming, improving its tax valuation. “It’s a bad answer to a worse situation,” Groene said of the amendment. Sen. Curt Friesen of Henderson also supported the amendment. He said allowing N-CORPE to make payments to the county in lieu of property taxes would hold school districts and other local entities harmless, which was the project’s original intent. Friesen said he would have stopped the formation of the N-CORPE project if he could have, but he says the project has served a beneficial purpose by allowing the state to meet its obligations under the compact with Kansas while allowing for some irrigation within the Republican River Basin. 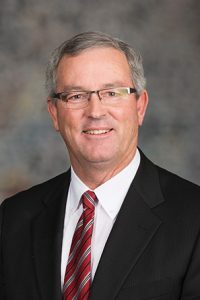 Omaha Sen. Burke Harr opposed the amendment, saying that it would allow N-CORPE to make payments less than the amount it otherwise would have to pay in property taxes. Harr said the NRDs are asking the Legislature to solve a problem when the state’s higher courts have not yet ruled on the issue. “I’m not sure why we’re coming to save their tail from a question they raised that still hasn’t been answered,” he said. Sen. Ernie Chambers of Omaha also opposed the amendment and the bill. He filed a floor amendment to the committee amendment in an effort to extend debate. After three hours of debate spanning two days, the Legislature moved to another item on the agenda. Per a practice implemented last year by Speaker Jim Scheer of Norfolk, the sponsor of a bill that is facing a potential filibuster must demonstrate sufficient support for a cloture motion before the measure will be scheduled for additional debate.